Work on the installation of new lifts started in August with an anticipated completion date of the end of February 2019. Continuing throughout all these works, there will be a team improving disabled access to the station to the front of the Station and linking up with the new disabled car parking spaces. The toilets in the station building have had to be closed due to some structural problems with the ceiling, however there are portable toilets provided in the drop-off area of the station. The Friends are currently working with the railway organisations on plans for making the station fully accessible. Contractors have been on site and carried out preliminary work on the lifts. The first stage was to dismantle parts of the existing goods lifts so that Network Rail’s contractors could carry out an assessment of the shafts, ready for passenger lifts. Plans for all the work necessary to make Hebden Bridge station fully step-free under the Access for All programme are expected to take another step forward in 2017 and Network Rail will be liaising with the Friends to take that forward. The lift is to be funded from the Access for All fund. Funding is agreed but no date provided other than by end of 2018. We were recently asked to provide information about what other access issues there were at the station. After a meeting with Calderdale's Disability Liaison Officer, a submission was made to Northern Rail about access issues additional to the requirement for a lift. Here are the two documents. Until platform staff were withdrawn in the mid-1980s there were lifts, hydraulically powered, on both platforms down to the subway to assist porters to barrow heavy and bulky items between platforms. Although the lifts are no longer in use the shafts, and the old workings, are still there but all boarded up. The issue of the re-installation of lift facilities at Hebden Bridge station, and the lack of disabled access that this would hope to address, has been an important item on the agenda of FoHBS for some time now. A feasibility study on the lift shafts was carried out by Metro in 2007. 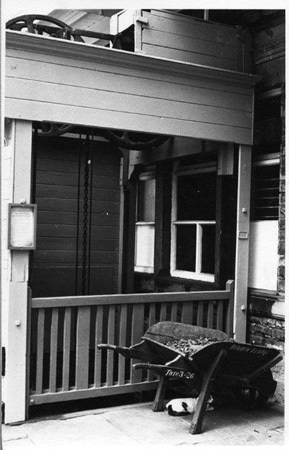 Whilst the conclusion of the report seems to suggest it would be possible to use the reconditioned shafts to install new lifts, this work was ruled out because of potential high capital costs and the ongoing administrative expense of manning the booking office extra hours to have staff on hand to cope with any emergencies that may occur associated with the lifts' operation. A figure of at least £1m was mentioned. As you are aware Metro nominated both Hebden Bridge and Todmorden stations for a lift scheme under DfT's National Access for All scheme last year and which is already funding lift provision at Shipley and Huddersfield. Unfortunately neither station was successful and much of this was because the passenger footfall was not considered high enough. Whilst they are both recognised as busy stations with high footfall for their catchment areas (400,885 and 338,405 respectively) when considered alongside stations such as Keighley (1,155,471) and other stations nationally they just aren't busy enough. FoHBS are more than welcome to lobby DfT to raise the profile of Hebden Bridge station. Frustrated that nothing was being achieved towards improving the situation, and potentially facing an indefinite wait for the DfT to include it on its programme of improvement, FoHBS set up a Working Party to examine ways in which lift facilities could be installed in the more immediate future. There are those who question the £1m cost of the installation of lifts, and also the need to extend booking office hours when acceptable alternatives exist to attending to emergencies within DDA regulative time periods. For example, an alarm facility could be connected to the nearest fire station who could attend to any emergency within a relatively short time period. Although the Fire Authority will charge for this service, the cost would be far less on the rare occasions that this happened than paying staff to work extra hours in the booking office. The Working Party arranged for an engineer to examine the shafts and put forward a proposal for the installation of a much cheaper lift which would comply with DDA regulations and achieve a solution. Lifts are indispensible for many disabled people, especially wheelchair users and carers, but would also be useful for passengers with heavy luggage or pushchairs, elderly people, and cyclists.